Five clever DIYs to tackle this weekend. We’re no strangers to a good Ikea Hack but, we’re leaving out everyone’s favorite how-did-I-just-spend-$100 store: Target! Target is home to some of our absolute favorite home decor finds, and things ring particularly true when we can hack our way to customization. From color-coordinated planters to spice racks-turned-beauty organizers, there are no shortage of ideas that are sure to surprise and inspire. Read on to see the hacks we’re loving right now. 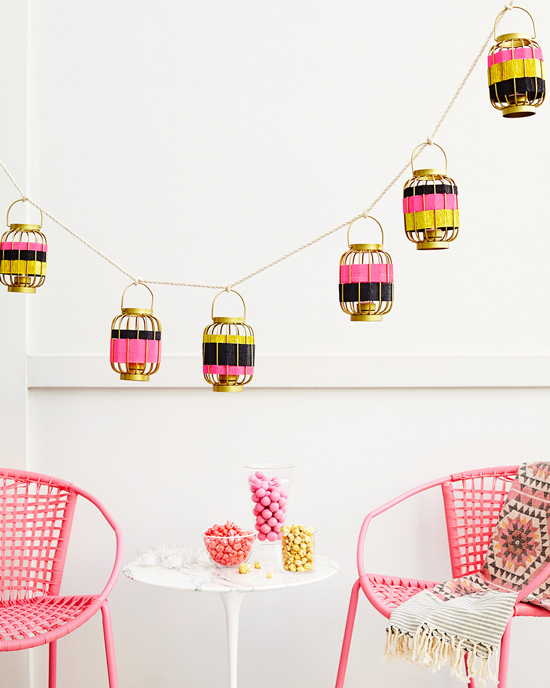 Outdoor-friendly lanterns are essentially the pinnacles of summer decor. The often versatile pieces can complement a wide variety of decorative schemes, standing in as quite the functional decorative accent. Dress up your walls for your next summer fete, courtesy of this ultra charming update on a traditional garland. Featuring a colorful crepe paper detail, the basic wire lanterns are transformed into a vibrant wall hanging that will instantly elevate your space. Get the how-to on Oh Joy! There is a lot more to this wooden, lacquered spice rack than meets the eye. While it can certainly uphold its intended purpose of functioning as a kitchen organizer, we can definitely think of an alternate use for the piece—a little DIY included. For anyone with an ever-growing beauty collection, the challenges of finding viable storage solutions are all too real. Whether your haul takes up the majority of your medicine cabinet, every drawer in your bathroom vanity, or both (and then some), it’s important to establish a separate zone for the items you find yourself using the most. This easy-to-revamp organizer will help you do just that, allowing for a curated shelving system that will keep your essentials close-at-hand. While we can’t deny the minimalist allure of this concrete planter, a colorful detail is always welcome, especially as we head into the warmer months. After all, one can only have so many gray and terracotta pots and planters. Give your plant corner the upgrade it deserves with these super cheerful hanging pots clad in the most inspired summer shades. The best part? The subject for this DIY came from Target’s Dollar aisle! Chic and budget-friendly never looked so good. Leave it to Jenni, of I Spy DIY, to serve us up with a revamp so detailed and bold, it has us questioning the original structure behind the DIY. A fresh coat of paint, stained poplar boards, and a handful of details by way of the retro-inspired labels transform a basic dresser into a must-have organizer. It’s safe to say that Target’s entertaining section boasts quite an impressive array of table linens. And while we’re constantly in awe of (read splurging on) the new napkins or runners the retailer has to offer, we can’t help but drum up a few ways to utilize the ones we already own. More often than not, we find that throw pillows tend to come at a surprisingly hefty price point, especially when an intricate print or pattern is involved. In lieu of shelling out the big bucks for a piece, you will inevitably want to swap out, take cues from the blogger behind Francois et Moi, who transformed a table runner into a boho-chic accent piece for the bedroom.